The Sierra Madre Tattler! : The Sierra Madre City Clerk Coup: So Why Was It Done? How can citizens of this town be assured that City Hall, now running the elections out of City Hall, will be honest and not heavy handed or tilt the outcomes to suit the councils decisions? The City Clerk was elected to her position, having a puplic flogging over the city saving a few bucks was humiliating and unnecessary. The City Clerk is an elected position, she was given her salary and guaranteed a contracted stipends on her serving her first day in that elected capacity, independent of City Hall. 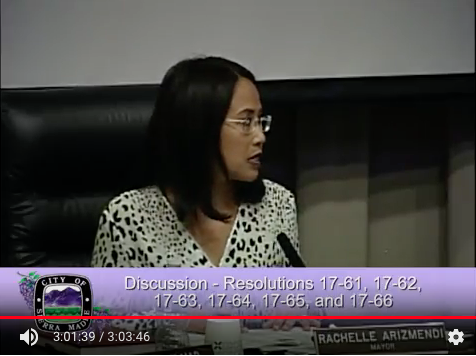 This was one of the most dishonest City Council meetings on record. The new manager showed a problem solving direction. The extremely highly paid attorney was prepared for questions. The Council all went in for the jugular; all to save a few bucks. I wonder just how honest the outcome of the UUT vote will be? With this Council the "fix" is already in. The city clerk has no experience running an election. She admitted this last night. Already she has missed deadlines and has received no training from the election company. Laura has worked with Nancy and has experience. It's more than putting out tables as John said. It's months of work. The election will be safe. The election inspector picks up the ballots and the process of handling the ballots is very transparent. Every ballot must be accounted for. The right decision was made last night. I was there and spoke to people after the meeting. I have also worked many elections. Now get out and vote in April. No conspiracy going on. Sound like the kinds of things they used to say about Nancy Shollenberger. Especially when they ran Karma Bell against her. Even if Carillo is grossly incompetent, she is an elected official. City Staff has an obligation to step in and work with her. That is what they are paid to do, not burn her in public. Or talk smack about her after the meeting. 10:41. What smack did you hear last night? I was there and didn't hear any. By the end of the meeting there were only about 6 members of the public there and you were not one of them. The best thing you can say about this mess is it was horribly handled. So much for the "best City Council we've ever had." Here we go again allowing the public to participate? strange grouping of words since city hall uses the public like it's private army of dilettantes to manipulate them and 'Tell them what the truth is' and they believe it 100%. First of all do not kill the messenger rather it's time to see City Hall in the correct light it was always bathing in, The words honesty, integrity are not to be used in any sentence from no on referring to or about City Hall and it's long or short term motives. trumpie cruelness at their best. Melinda Carillo for City Council. No way. Nice but no way. Couldn't be any worse than Gene Goss. It looks like the fix was in based upon years of not seeing and knowing what has gone on in this town. What a shame to watch this sham. If you don't know what a sham is look it up in the dictionary. If you don't know what a sham is, simply watch the meeting. LOL! "It looks like the fix was in based upon years of not seeing and knowing what has gone on in this town." ??? I think you need to look up in the dictionary the idiom "the fix is in"
Someone mentioned the highly paid city attorney-start there if you want to save money! Having no city clerk is an abomination. The City Council is very selective about where they save our money. To save money why doesn't the city manager just have a secretary? Why do we pay so much for an assistant city manager when what were really talking about is a secretary's function? I have never seen a city official beaten up by the city council like that. Even during the darkest days of the Buchanan years. So ugly. Just like Ms. Carillo, the Assistant City Manager is a nice person but look at the history of who and why this position was established. If the City Manager is really doing the job then a secretary's pay would be a big savings for the City. When discussed with others it appears many feel were paying too much for a city attorney. In the past when it went out to bid there were bids that were lower than what we are paying now. In the past based on subjects regarding property rights the city attorney had to go back to the office and come back with an answer when it was a state code that I looked up during the council meeting. Looked like padding the firms billing to me. Talking about saving money on costs is it time to reevaluate legal costs. Has this firm saved us any money on lawsuits based on there experiences? I think not! Forensic Audit before this City Council gets any more tax paying dollars. Where has all the money gone over these many years? Not for water main and pipe replacement. Not for upkeep of the town library. New beginnings, than begin with coming clean on the entire mess this city is in. Tried that. John Buchanan led council wouldn't go for it. No council since has been interested. 6:55am. More like Clinton lies and cover up. For what? And even if I was, it would sure beat being a volunteer treason enabler. Why must the City Attorney and team be at each and every Council and Planning Commission meeting? It was never that way before; if the Council is looking to save money, put the bids back out for less expensive legal representation. Tried that. The competition was between our current law firm and a firm that specialized in water rights. If you go by what the council used as an excuse for the hours spent on preparing materials; then look no further than the Planning Department Director. Nice guy, zero background and experience in City Planning. Elaine handpicked and hired this man from Los Angeles Metro Division. He is learning about City Planning while on the job. Why? What is the reasoning behind this hire? This council was hot and heavy at spending money reserved and earmarked for the Arts; instead they all want to build a Starbucks pergola and rip out Kersting Court. This Council spent $5,000 on local artists rendering of a front cover for the General Plan. Where was the savings in that? the city clerk has been a sham position for years. poor note taking. missing items in records. rarely on site at city hall for the public. city employees had to do most of her job. does she still have city records at her house? if the new clerk was indoctrinated by the outgoing clerk, i can just imagine what she thinks she's required to do. Oh good. The dirts are starting to wake up. Back up your claims 8:56! "Rarely on site at City Hall"? Remember when Karma Bell was running for City Clerk, she said she would hang out at City Hall so people could contact her...and do what? Nancy Scholenberger was readily available, all you had to do was call her, and she would show up in 10 minutes. By the way, Karma also said she would have a City Hall employee take the minutes. Wake up or sober up? The new clerk didn't accept offers of training. Help was always a phone call away. If you are bleeding and don't call the paramedics, whose fault is it if you bleed to death? If this is true, why didn't any of the five City Councilmembers say it? All I heard them talk about was money. was involved in the election process on election day. Planning Director is there to warm a seat until he retires. Oh, and rubber stamp whatever Elaine wanted. In a topical Apprentice fashion; NBC told Mat Lauer, "You're Fired"! Pigs of a feather fly together. 8:56am Lol, you must be a new resident in town. If any legal challenges were brought against the city, and there were many, then the records recorded with the City Clerk were impeccable. Can you say the same going forward? Yep, tons of detailed records. Sounds like it's time to clean the skeletons out of all closets. 8:56am. Oh goody. I heard that the city had no training from the City Clerk. It is good to know that there wont be any problems going forth with the city employees having the necessary background as you've stated. My Constitutional rights are at stake when I go to cast my vote. City Council elections in Sierra Madre will now be run by city employees, most of whom have a direct financial stake in the outcome, belong to activist unions and don't live in town. Yes, this really was a coup. Filing documents and meeting deadlines has nothing to do with the outcome of an election . I suggest that you volunteer to work at the polls from 6am to 9:30 pm, then go with the sealed ballots to city hall and watch them being counted. The City Council spent around $750,000 last night. Including costs for training. Can you tell me that all of these were necessary? Just watched the video on YouTube. That Goss is one mean a-hole. This council is too busy throwing parties and expensive dinners for accolades for themselves. Now that's what I call being fiscally responsible! The video shows how this council hand picked the questions going out in the survey about the Library. Idiots! If you live in town, you know where the YAC/Recreation Center is located. Sierra Madre Planning Commission works towards the future direction of this town; only to be overturned by this City Council. Is the public still reduced to the whims of City Hall and the reduced hours that they are open due to their heavy workload? Minnesota Public Radio: Garrison Keillor, your fired! When does serial molester Trump get fired? 10:57am. So says the Developer that has an eye on the property where the Library now sits! 11:06am. Volunteer for work? Which is it? Are you volunteering or getting paid by City Hall to count the ballots? If you work for the city,than I would say that you have a conflict of interest. to work at the polls. It involves possible set up the day before and 6 am until the ballots tally which is usually after 9 :30 pm. After all the ballots are accounted for....they are numbered. All the poll workers sign the container which holds the ballots and it is sealed. It is then transported to city hall by two people and usually another car follows the ballots for the safety of the ballots. The seal is broken by a voting official and are counted in front of the public. All of the poll workers receive a small stipend of about $85, no breaks if the polls are busy and lunch and dinner breaks happen if there is a lull. The poll workers DO NOT count the ballots. They only account for the number of ballots. Martin and Chapman count the ballots the Another thing the first voter inspects the empty ballot box and witnesses it being locked. It's a very long day and it's very interesting. I suggest you let the City Clerk know that you are available to work the polls. The pay is about $6.00 an hour. Responsibilities of a City Clerk. As an Elections Official, the City Clerk administers Federal, State, and Local procedures through which local government representatives are selected. The City Clerk assists candidates in meeting their legal responsibilities before, during and after an election. Why should a city employee be held accountable for this? How much time will that take away from their city duties? We have an Assistant City Manager because years ago Jim McRae, City Administrator (title of this employee position later changed) was determined to be incompetent by the City Council. They insisted he get an assistant to help him. Prior to that there was an Administrative Assistant (ie. executive secretary). All in all, our elected official, the City Clerk, is being insulted and mistreated publically. Our vote for her has been undermined. This IS an injustice to the democratic process and I protest! 1:16, It is definitely an injustice. It cries out to heaven when a person is cheated out of their just wages. This was a bait and switch! Councilmen will answer for this cheap, shrewd move. Maybe the city gave Laura Aguilar the ability to run the elections so they can have control of any Prop 218 signature efforts. 1:51pm. You got that right. Just like the last 218 process where the Cities Attorney made the decision that only water main house holds would get a vote. Now this same Law Firm will over see the deadlines, and submittals for running as a Councilmen? 12:58pm. Re play the Council meeting. I understood that Martin and Chapman are not returning for this election. And please clarify; city workers do not work for the city? Typo on an iPad. City employees do no work at the polls. From what I heard at the meeti g is Martin and Chapman are on board for the election they just didn't have their usual training class. This council spends money like no one else can. Why argue with the City Clerk in a very public venue about a few dollars. What is this council hidding? It sounds more like Rob Stockly is still in control of City Hall. Is he on the Library Board? If this is the last year of the City in charge of elections, then who are they fooling; $7,500 is nothing to this council. Someone is trying to have control over how the citizens vote in this town by trying to mislead us on increasing taxes or creating a parcel tax. Something is just wrong with the entire way that meeting was held. 7:47,,, 7:39 here. A long day at work here so a little delayed response to your comment on fix. Thank you for putting up a new word for me to learn, idiom : an expression that cannot be understood from the meanings of its separate words but that has a separate meaning of its own : a form of a language that is spoken in a particular area and that uses some of its own words, grammar, and pronunciations. Maybe by using the word fix I was showing my age or a field of employment I work in or maybe your just young and not to worldly. Anyway I did also look up fix in the dictionary and found that under Full Definition, transitive verb item 7b it said :to influence the actions, outcome, or effect of by improper or illegal methods "the race had been fixed". I will now finish reading the rest of the comments. A good evening to you and yours. Perhaps you meant to say ‘not too wordly’..
At least your SM mayor can speak intelligent unlike the present bafoon Amundsen in Arcadia. Heard him try to run a meeting? Rachelle has a politician's ability to sound like she is saying something without actually sharing anything useful. 8:56 writes with a forked tongue. 6:23, 7:39 what do you care what 7:47 says? We all know what a fix means! Anyone know what the helicopter/police/fire truck up at One Carter was about?